Irma Becerra-Fernandez, vice president of FIU’s Office of Engagement, has been named Education-Administrator of the Year by Great Minds in STEM. Becerra-Fernandez, who has a doctorate in electrical engineering from FIU, will be one of 26 recipients recognized at the 25th Annual Hispanic Engineer National Achievement Awards Corporation (HENAAC) Conference in New Orleans from Oct. 3-5. Becerra-Fernandez is the ninth individual from FIU to receive a HENAAC Award. Great Minds in STEM is an organization that promotes the STEM subjects (science, technology, engineering and mathematics) to underserved communities throughout the United States. The goal is to have those students pursue STEM-based careers. The HENAAC Awards recognize the achievements of the nations’ top engineers and scientists within the Hispanic community. Becerra-Fernandez’s work assisting the growth of STEM education spans more than a decade. Beginning in the late 1990s as a professor of information systems, she taught graduate students in the FIU College of Business. 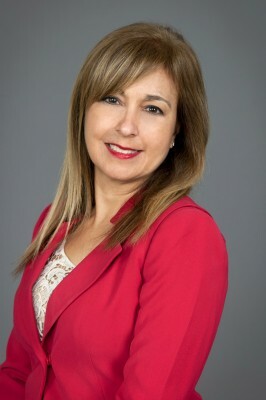 Selected as FIU’s vice provost of academic affairs in 2011, Becerra-Fernandez co-chaired math and writing initiatives. The math initiative introduced a math lab for students to assist them with college algebra and subsequent math classes within a high-tech environment. The writing initiative sought to improve undergraduate writing and critical thinking skills by implementing “Writing Across the Curriculum,’’ which required students to take at least one writing intensive course in their major. Becerra-Fernandez also co-chaired a Ph.D. minority initiative to increase the number of minority students pursuing doctorate degrees, specifically in STEM subjects. As vice president of engagement, Becerra-Fernandez leads many community partnerships, including The Education Effect and Life Sciences South Florida, to help meet the needs of STEM education, research and career growth in South Florida. 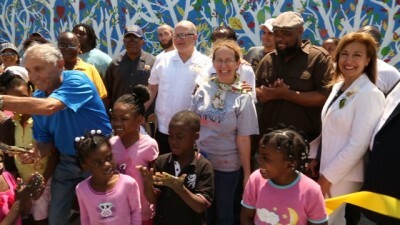 Dr. Becerra-Fernandez, FIU’s vice president of engagement, participates in a mural project in Liberty City, where FIU has a partnership with Miami Northwestern Senior High School called The Education Effect. The Education Effect is a partnership between FIU and Miami-Dade County Public Schools to provide university resources specifically to Miami Northwestern Senior High School in Liberty City and its feeder schools, Charles Drew Middle School and Holmes Elementary School. The partnership is funded by a $1 million seed grant from JPMorgan Chase. The Education Effect provides resources for a financial literacy program, dual enrollment and an aquaponics lab, the first of its kind in a Miami-Dade County public school. An initiative spearheaded by FIU and the Beacon Council, Life Sciences South Florida is a partnership between local universities, state colleges, research institutes and research parks to foster interest and growth in biotechnology, pharmaceuticals, diagnostics and information technology to generate high-tech, high-paying jobs. With the launch of LSSF’s STEM Undergraduate Research Symposium, students are given the opportunity to compete for prizes, learn from other students throughout South Florida and network with industry leaders, Becerra-Fernandez said. Becerra-Fernandez said her goals for the Office of Engagement are to expand The Education Effect, provide more STEM-based dual enrollment opportunities for students and increase the impact of Life Sciences South Florida. For more information on the Office of Engagement or its programs, visit www.engagement.fiu.edu. When Dr. Becerra-Fernandez left the College, it was a loss for the College… but as expected, it was a huge gain for the University.